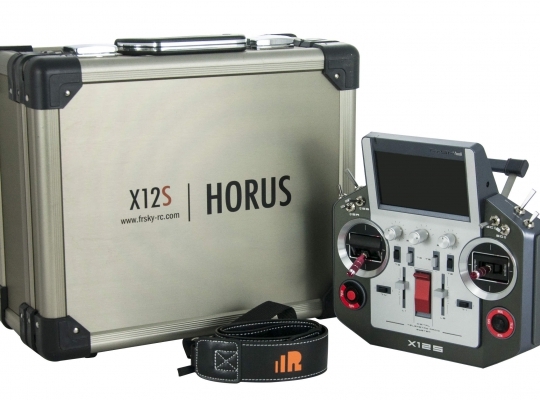 The Horus X12S is FrSky's flagship transmitter, with an impressive 4.3 inch, TFT color display. The 480 x 272 transflective display produces sharp, colorful images even when viewed in direct sunlight. The rotary encoder and 6 well placed, tactile pushbuttons allow quick navigation of the various menus and programming their contents. The radio has a solid feel which inspires a sensation of quality. The gimbals are FrSky's best, in CNC milled aluminium with 6 ball bearings and contactless hall effect sensors. Steel cross bars pivoting on ball bearings and a teflon contact surface give the gimbals a very positive feel around center and a silky smooth travel. The Switches and pots are also high quality units. 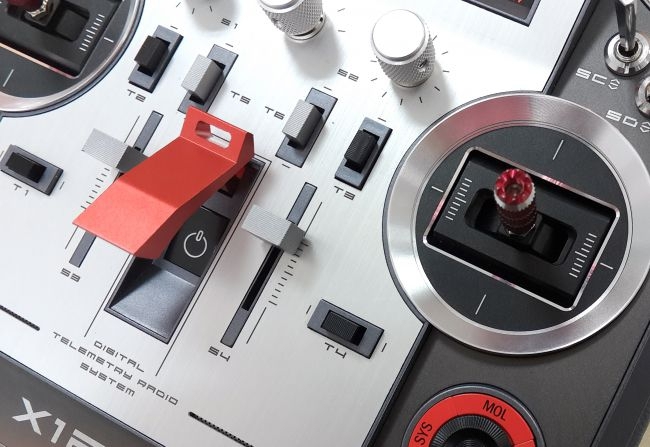 The switches have a positive action, while the pots and sliders are silky smooth. The most important aspect for any transmitter is maintaining a rock solid connection with the receiver. FrSky is well known for its frequency hopping ACCST technology taking advantage of the entire 2.4GHz band, resulting in excellent range and reliability. The Horus is compatible with most of FrSky's Telemetry and non-Telemetry receivers as well as sensors. With a suitable tx module, the JR style external RF module bay allows operation with Futaba, Spektrum, JR, Aisin, and other receivers. The radio has the ability to run two different operating systems. 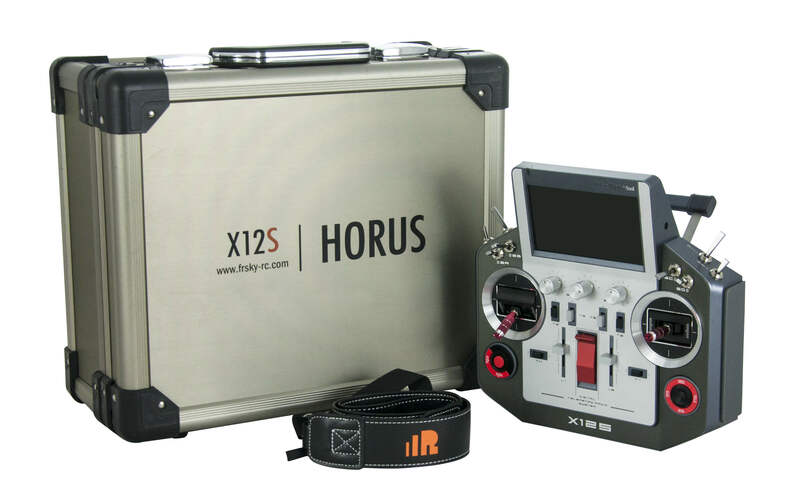 The Horus is supplied with FrSky's FrTX Operating System, which is and easy to program, intuitive menu driven operating system. Advanced users are able to install OpenTX. The Open TX developers have created a visually impressive interface for the feature rich OpenTX 2.2 operating system. Both operating systems are continually being developed and will provide additional features and capabilities to the Horus as time goes on. The Horus transmitter makes use of FrSky's bidirectional "ACCST" (Advanced Continuous Channel Shifting Technology) communication system. This frequency hopping technology takes advantage of the entire 2.4GHz band resulting in excellent range and reliability. The most important aspect for any transmitter is maintaining a rock solid connection with the receiver. ACCST is perhaps the most reliable protocol on the market today. Being bidirectional means that as well as the transmitter controlling the receiver, data from the receiver can be sent to your transmitter. FrSky knows many things can affect the connection between Transmitter and receiver so RSSI (receiver signal strength indication) is incorporated into all telemetry receivers. The Horus transmitter is continually monitoring the reception quality at the aircraft, and will alert the pilot before signal quality becomes critical. This saves planes and makes the hobby much safer! Horus has a newly designed internal RF module IXJT with lower latency and higher stability. Telemetry data is used for real-time monitoring of the received signal quality. Alerts can be set up to warn you when the RSSI value drops below a minimum value, indicating that you’re in danger of flying out of range. Factors affecting the signal quality include external interference, excessive distance, badly oriented or damaged antennas etc. The SWR function monitors the efficiency of the radio's transmitter antenna. If the value is above the selected value, an alert can be generated by the system. The internal and external antennas are selectable for the internal RF module. 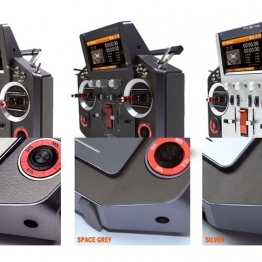 The Horus has a normal JR style module bay on the back that will accept modules for other transmitting protocols, including Futaba, Spektrum, and JR. The external bay also allows you to add another FrSky module to your Horus, giving you a total of 32 channels if you use the eight discrete channels and eight serial SBUS channels available on each module. SBUS is a type of serial communication protocol that allows you to utilize servos specifically designed for SBUS operation and supports multiple channels using only one daisy-chained signal cable. Horus has three different types of Failsafe, to help you recover your airplane should you experience a loss of control signal to the receiver: simply holding the last received positions, turning off pulses (for use with flight controllers having return-to-home GPS on loss of signal), or moving the servos to custom predefined positions. The RSSI feature means you probably won't ever use the failsafe. Your Horus warns you when the received signal strength is becoming too low, allowing you to correct the situation before a loss of signal occurs. The Horus has inbuilt telemetry display capability, so you don’t need additional add-ons or 3rd party devices to display telemetry information. The Horus has a large industrial high resolution colour TFT screen (480 x 272), readable outdoors. 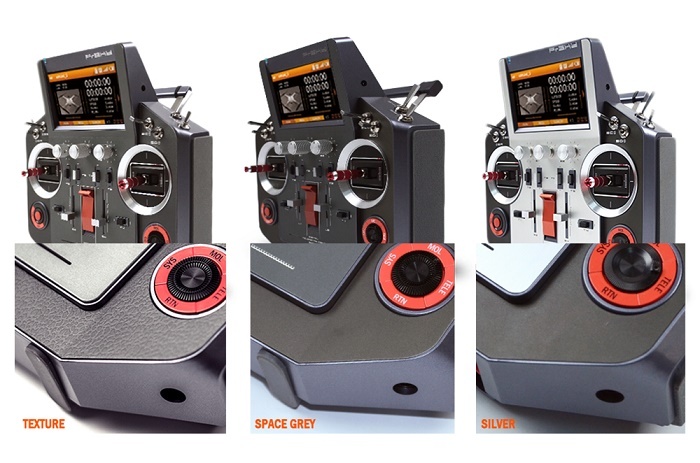 The gimbals have CNC milled aluminium rotating parts and frames, and are equipped with 6 ball bearings in each unit (two on the return to centre mechanism) with Hall effect sensors, for a superior quality feel, precision and durability. The stick lengths are adjustable. Model data, music files, voice files and picture files can be stored on the optional micro SD or SDHC card. The SD card can also be used when updating the software/features of the Horus. The Horus has two speakers, allowing stereo play back of WAV (Waveform Audio Format) and MP3 files stored on it's SD-Card. You can easily add custom sound files of your own. The Horus also offers vibration as an additional pilot feedback for alarms, etc. Integrated GPS module and 6-axis sensor (3-axis gyro and 3-axis accelerometer) to facilitate auxiliary control by tilting the transmitter. The high capacity low self-discharge 2000mAh 9.6V NiMH Battery gives you extended flight time. Up to 8 channels can be shared between two Horus transmitters using the wireless connection. 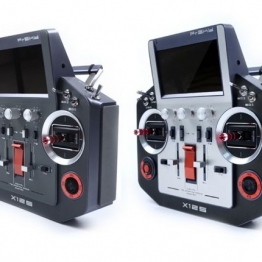 Two different cable options can also be used for connection to other transmitters, either Taranis/Futaba style or JR/Graupner DSC. The open-source software for the Horus has been developed by hobbyists for hobbyists in the R/C community. The programmers of the transmitter firmware and companion PC software which runs on Linux, Windows, and Macintosh are very receptive to input and requests from users. There are no limitations based on marketing decisions. If you can think of it, chances are the Horus is capable of doing it. With 60 model memories, tons of mixes, 9 flight modes, sequencing, servo speed, programmed delays, all kinds of triggers, and the ability to assign any channel to anything, it is hard to come up with something this radio can't do. A nice feature of the radio is the ability to connect to a PC via the USB port, allowing you to move files between the PC and the radio, including telemetry data files for analysis. The USB port can be configured as a joystick for Flight Simulator (PC) compatibility. Horus has a safe power switch. The switch cover (with integrated strap base) prevents accidental operations. 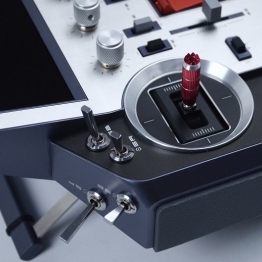 The 6-position encoder can be configured (for example) as an easier flight mode switch. • NiMH 9.6V 2000 mAh integrated battery inside the radio with a built-in charging circuit. • Operating temperature: -10°C - 60 °C. • Operating barometric pressure: 860MBar-1060Mbar. • 16 channels (32 channels when combined with an external XJT module) . • System: D16, D8, LR12, switchable. • JR Style module bay for additional RF modules. • Selectable tx mode (1, 2, 3, or 4). • Long range system capable of up to 2 times the range of current 2.4 systems. • Receiver lock (program locked to aircraft - limited to FrSky receivers running PXX protocol). • Compatibility: FrSky X series, D series and V8-II series receivers (plus other receivers if an external module is used). 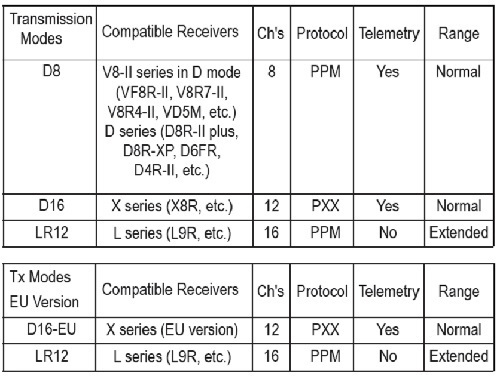 Note that the Horus-EU version is only compatible with X series EU version receivers. • 60 model memories (extendable by SD card). 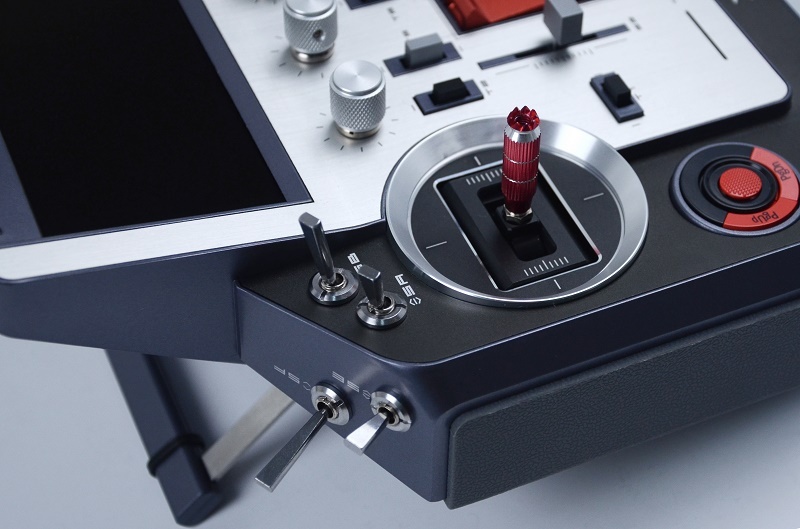 • 64 mixers, 9 flight modes. • 16 custom curves with 3 x 17 points each. • Trims - Adjustable from course to extra fine with extended and exponential trim options. • Full telemetry ACCST 2.4GHz system using the PXX protocol for super low latency. • RSSI alarms (warns you of receiver signal reception problems before disaster strikes). • High Resolution colour TFT (480*272), readable outdoor. • New gimbals: CNC machined, equipped with 6 bearings to soften the friction, hall sensors and extensible ends. • New 6 position encoder. 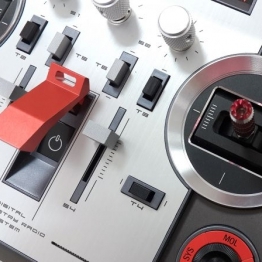 Now you can configure up to 5 flight modes on a single rotary switch. • Voice or custom sound alerts. • Haptic feedback: The radio notifies you with vibrations. • MP3 player allows playing of background music. • USB connection (Mini USB B connector) for firmware upgrades, R/W to the microSD card and integrate with OpenTX Companion. • Power on button: The radio power button stays protected under the metal support to hang the Horus, to avoid turning it off by mistake. It even has a confirmation message for added protection. • Training System: new and revolutionary WiFi trainer system. 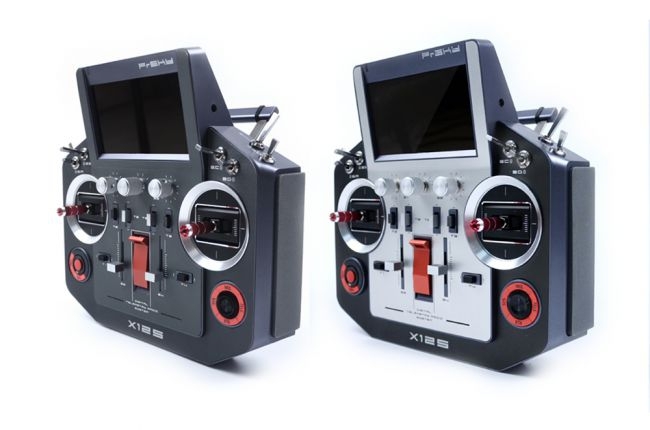 • Training port: Two trainer port types to improve compatibility with Taranis/Futaba and JR/Graupner DSC radios. • Integrated GPS module and 6axis sensor (3axis gyro and 3axis accelerometer) to facilitate auxiliary control by tilting the transmitter. • 3 finishes to choose from between matte, textured and aluminium details on the front panel. • State-of-the-art open source software. • Integrates with OpenTX Companion (Windows/Mac/Linux) allowing saving, editing and sharing of models and settings, as well as simulation of transmitter or model setup. • Multiple language support (configured for English by default).